Rome—a destination of love and conquest, of fame and ruin. For our second Rome appetizer, we leave Piazza Venezia and move on to the Capitoline, the most famous of the Seven Hills of Rome. The hill consists of two separate hilltops used for different purposes. The church of Santa Maria in Aracoeli currently stands on one hilltop, the other occupied by the remains of the Great Temple of Jupiter. A massive structure awaits us at the center of the two hills. The Piazza el Campidoglio. Michelangelo conceived this plaza, which contains three palaces or Palazzo. To reach the plaza, you must climb the broad steps of the staircase (Cordonata), passing two carved lions and several statues, including those of Constantine and Constantine II. Once in the plaza, you face the Palazzo Senatorio with two other palaces on the left and right. The impressive, oversized statue of Marcus Aurelius occupies the center of the plaza. Palazzo Nuovo (or Capitoline Museum) is to the right of Palazzo Senatorio and mirrors the construction of Palazzo dei Conservatori across the plaza. Though shorter than Palazzo Senatorio, both rooflines are also decorated with statues at regular intervals on top of a stone balustrade. Both palaces house a treasure of statues and artwork. In the Nuovo palace, a statue of Athena, the “statue of Minerva (5th Century B.C. )” and a statue of Venus, dating to the 2nd century B.C., are a great beginning. But entire rooms display busts of Roman Emperors and Philosophers, such as Socrates and Homer. Exhibits of Egyptian and Oriental artifacts grace its halls. For those interested in legends, there are statues of Centaurs and Fauns. Palazzo Conservatori is equally impressive. 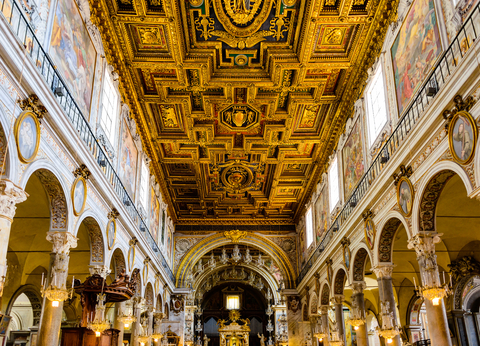 If we ascend the summit of the Capitoline hill, we discover the Church of Santa Maria in Aracoeli. The stairway is far less decorative than others, but your climb will be worth the reward. Inside of the church, the ceiling depicts the naval battle of Lepanto—the conquering of the Turks. An exquisite painting of the Virgin Mary and a wooden statue of infant Jesus, called Bambino dell’ Aracoeli, draw you into their presence. During the Christmas period, children “recite prayers and religious songs” in front of the Bambino.